It was in April 2005 that we were seriously tackling the subject of Greek corruption. On the back of a report that Commission President Barroso had spent a six days on the luxury yacht of Spiros Latsis, one of the richest and most powerful businessman in Greece, we started looking into business details of the Latsis empire, culminating in a detailed report in the Booker column. It was then that our contacts started to go missing – and I really do mean "missing". People with whom we had been in daily contact, from whom we were getting vital information for our inquiries, simply disappeared – they went off the radar. Then the Latsis lawyers moved in. The Telegraph - as it always does – instantly folded and removed our stories. You will find that this link yields nothing at all. And, with none of the other papers covering the story, the Latsis saga has been expunged from the record. From that we learned that reporting corruption in Greece was not going to be easy and, for some, it was definitely harmful to health. Furthermore, the Greek media is never going to cover it seriously – most of the big titles are owned by the Greek magnates, living off the triangle of corruption supported by bank ownership, shipping and construction. Independent journalists brave enough to probe have been known to get death threats. Back in 2005, we were covering serious allegations concerning corruption in motorway-building, and the ongoing saga of Athens Airport. Ten years later, these issues are back again in the news, courtesy of Aljazeera, with exactly the same cast of characters. And the sort of money we are talking about is not in the millions, nor even the hundreds of millions. We are talking billions. The public purse is being raided on a scale that beggars imagination. In just one deal, state property worth $6.8 billion was sold for just $1.2 billion, while the state then carried costs of $3.4 billion to relocate administration services displaced by the sale and to reconstruct infrastructure. This was part of the privatisation programme demanded under the last (second) bailout deal. Another part had 28 buildings owned by the government sold off to buyers for $355 million. One beneficiary was Eurobank Properties, a subsidiary of Eurobank – owned by the Latsis family. But, as part of the deal, the buildings were leased back to the state for 20 years, with just 14 of the buildings taking more than $19 million per year in rents. In another deal, a consortium led by Lamda Development (a real estate developer controlled by Spiro Latsis) obtained a 99-year lease on the 40,000 square metre area of former Athens airport at Hellenikon. They paid €426 million for a lease that was valued at €2.5 billion. These are only a few examples. The list of corrupt or suspect deals associated with the privatisation programme would run to many pages. The cumulative transfer of state wealth to the criminal élite runs to tens if not hundreds of billions of euros. One particularly egregious example came in February last year when the biggest privatisation deal to date came under the scrutiny of the Athens prosecutor. This was the sale of OPAP, the state gambling monopoly and the country's biggest sports sponsor. It had been sold to a group of Czech, Russian, Slovak and Greek investors, via Emma Delta, a Cyprus-registered bidding vehicle, paid €650 million for the state's 33 percent stake – the only valid offer, allocated under "unusual" circumstances. Meanwhile, Greek shipowner Victor Rest was also facing an Athens public prosecutor to face criminal charges of embezzlement and money laundering through an Athens bank controlled by his family. Mr Restis, who controlled one of the largest Greek commercial fleets with about 90 vessels, had been arrested after a crackdown on tax evasion and money laundering that had led to more 600 businesspeople being jailed. Restis was accused of embezzling €5.8m from First Business Bank, a small private lender in which his family held a 64 percent stake. Unfortunately, in the EU's Single Market, corruption knows no borders. From the Greek heartland, it spills over into other countries. In 2010, for instance, Robert John Dougall, a former Director of Marketing for DePuy International (DPI) Limited, selling orthopaedic products to the Greek healthcare system, was convicted in a British court of corruption, after admitting his involvement in £4.5 million corrupt payments to Greek medical professionals. DPI used a local distributor, Medec SA, which was owned and run by Mr Nikolaos Karagiannis, to whom "commission" was paid in advance for use by Karagiannis to induce or reward surgeons to use DPI products. In 2004, when DPI decided to terminate the use of intermediaries in the Greek market, Dougall indicated that terminating the use of intermediaries would result in a 95 percent loss on their Greek turnover. This current year saw an investigation into the Aktor company for giving bribes to officials in Macedonia in order to win the €270 million contract on the construction of the Demir Kapija-Smokvica motorway. The Greek company won the tender even though its bid had been the highest. Earlier, a much bigger fish had been caught - Vassilis Papageorgopoulos, a former mayor of Greece's second city Thessaloniki. He, with two other ex-officials, had been jailed for life for embezzling almost €18 million of public funds. The court ruled that Papageorgopoulos had been a key part of a scam that lasted between 1999 and 2008. His penalty was believed to be the longest given to any Greek politician convicted of corruption. Then, in October 2013, former defence minister Akis Tsochatzopoulos had been found guilty of money laundering, after having previously been found guilty of taking bribes. He had served as a minister in several Greek Socialist governments over the past 30 years, and had received millions of euros in bribes in relation to defence contracts agreed during his tenure, from 1996 to 2001. The contracts related to the purchase of German submarines and Russian missile systems for the Greek navy. As well as Tsochatzopoulos, 16 out of 18 co-defendants were convicted of involvement in the fraud, including his wife Vicky Tsamati, ex-wife Gudrun Tsochatzopoulos and daughter Areti Tsochatzopoulos. The Greek judiciary's then followed up with a further investigation, netting another shipping personality, Sotiris Emmanouil, the former managing director of Hellenic Shipyards, Greece's largest shipyard. He was arrested in his luxury home on 13 January 2014 in connection with taking bribes of some €23m to secure submarine deals with Germany's HDW Ferrostaal. Also arrested was an associate of ex-Defence minister Akis Tsochatzopoulos, Yiannis Beltsios. A follow-up investigation looked into allegations of huge bribes being paid to Greek officials by German companies to secure an order for four submarines from the Greek navy. Two former managers of Ferrostaal AG had also been charged in Munich with paying bribes of more than €62 million to secure submarine orders in Greece and Portugal from 2000 through to 2007. Allegations levelled against Emmanouil were that the bribes had been paid by Ferrostaal, which brokered deals for German shipbuilder HDW in 2000 and 2002. The contract is said to have been worth upwards of Euro 1.8 billion. One of the Class 214-type submarines had been built in HDW's Kiel yard in Germany, and the other three in Greece's Hellenic Shipyards. Then along came the Hellenic Postbank scandal, where unsecured loans worth €110.5 million had been given to insurance and media magnate Dimitri Contominas, owner of Alpha TV and Demco insurance, and €100 million to industrialist Lavrentis Lavrentiadis. The chairman of the bank from 2007 to 2009, Angelos Filippidis, had played a central role in the scandal by "abusing his position", estimating that loans to the value of at least €347 million were issued "beyond any acceptable banking criteria". Stripped of its toxic debts, the bank was eventually sold at a knock-down price to Eurobank, a bank which itself had to received €13.3 billion in rescue funding. A few months later the government handed over the bank's keys to a consortium made up of its existing owners and foreign (primarily hedge) funds, keeping equity of €2 billion. Latsis's EFG Group - holding company for Eurobank – meanwhile, from its group headquarters in Zurich was linked with the tax evasion scandal after deals had been secured with Luxembourg, under the aegis of prime minister Jean-Claude Juncker, now Commission President. Returning to foreign bribery, the OECD lists many more examples and remarks that Greece "does not give sufficient priority to fighting foreign bribery". The risk of Greek companies committing foreign bribery was "substantial", it said, adding that it needed "to be squarely and explicitly addressed". It was "very disappointing", said the OECD, "that the risk does not appear to be fully appreciated by the Greek authorities". In fact, the organisation concluded, Greek government policies continue to only address "corruption" generally which is interpreted as referring only to domestic corruption. This sends an unfortunate message to the Greek public and businesses: that during an economic crisis, domestic corruption must be forcefully tackled, but foreign bribery is an acceptable means to win overseas business and improve Greece's economy. Even within Greece, though, corruption still filters down to every level of society. In June 2014, Greek police identified 51 doctors responsible for fraudulent prescriptions drawn from a seaman's medical fund, the scripts often issued in the names of dead people, provisionally costed at €150,000. In a country where there was a glut of doctors, 6.1 per 1,000 residents in 2009 – the most in any country tracked by the OECD – public-sector drug spending had doubled in the five years to 2009. Underpaid physicians seeking to supplement their incomes were susceptible to pressure from drugmakers to prescribe the newest, most expensive medicines, even when cheaper drugs would have sufficed. Some doctors write prescriptions for patients who don't exist, or who aren't sick at all. A portion of those drugs are then shipped out of the country and resold in markets where they garner higher prices than in Greece. Exports of fraudulently prescribed treatments were recently estimated at between €50-200 million a year. However, the medical profession is taking its cut from both ends of the chain. At the end of last year, the Guardian was recalling how in the summer a lift at Athens's largest public hospital had broken down. A repair technician found knee-deep at the bottom of the shaft hundreds of envelopes (fakelakia) the vessels for bribes to doctors who then dispensed with the evidence. Said Aliki Mouriki, a sociologist at the National Centre for Social Research: "Corruption in Greece is alive and well. In fact, if anything, people are now so squeezed they have fewer inhibitions about taking bribes than before the crisis". So bad has the situation become that, recently, the Wall Street Journal was noticing "no bribery" signs on the walls of Greek public hospitals. All in all, petty corruption cost Greeks €511 million in 2011. Yet corruption comes in many other forms. After the last bailout, the Greek government found itself halting welfare or pension payments for over 200,000 people, either because they were not entitled to the money, or because they were dead. An unusually high number of 9,000 Greek centenarians drawing old-age benefits had prompted the authorities to take a closer look. Officials also became suspicious when they noticed unusual concentrations of blind or disabled people in certain cities and islands, where corrupt social security employees were at work. Simple data cross checks had revealed the abuse. Individuals have other ways of cheating the system, producing and marketing contraband cigarettes on such a huge scale that the industry represents eight percent of the total cigarette consumption in the country, depriving the Greek state of millions in taxes. Ongoing seizures indicate that there has been no slackening in this activity. And nor are just cigarettes the focus of illegal trade. The partially privatised port of Piraeus has become the main European portal for counterfeit goods from China. And alongside the multiple facets of dishonesty which taint Greek society, tax evasion plays a key part. In fact, it is difficult to be honest. One doctor claimed to have declared all his income and scrupulously paying taxes. Despite that, he was hit with a huge tax bill. "We know you hide 40 percent of your income", the tax inspector had told him. "So we've charged you accordingly". The doctor promptly stopped reporting his full income. With that, it is estimated that at least €28 billion of income went untaxed in Greece for 2009. At the tax rate of 40 percent, the foregone tax revenues accounted for 32 percent of the county's deficit. Every year is much the same, with the cumulative underpayments this century amounting to far more than the bailout of €86 billion that has torn the country apart. Academic economists, Yannis Ioannides and Costas Azariadis, write of an "entire value system of nihilism and antisocial behaviour", which has percolated throughout Greek society. Research, they say, "has shown that Greece's culture of mistrust and cheating is far more extreme than anywhere in Europe". In a black market that accounts for 30 percent of the economy, and where two out of three Greeks commit tax evasion, 80 percent of Greeks believe it's all right to claim government benefits to which they are not entitled, while 20 percent disapprove. In most of Europe, the ratio is almost exactly the reverse. Thus, nothing changes. Greece's super-rich have been almost unaffected by the crisis and, despite those few high profile cases, more cases of alleged corruption are abandoned than pursued. But where corruption is such a way of life, any idea of Greece being a functioning state, much less a democracy, is hardly tenable. And for outside agencies, such as EU institutions, to lend any money to this kleptocracy, with anything other than the most rigorous controls, would be absurd. 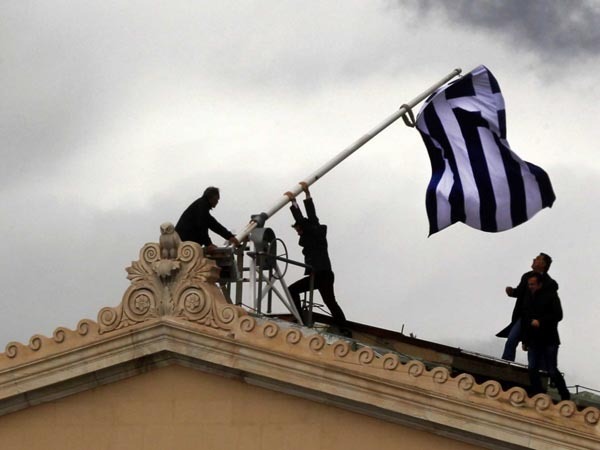 Thus, while it is fashionable in some quarters to paint Greece as the victim in the current bailout round, a country so afflicted with corruption could hardly be treated any different to what it is now.